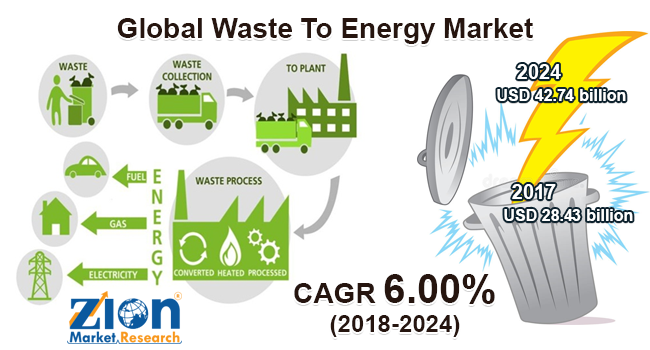 Zion Market Research has published a new report titled “Waste To Energy Market by Technology (Thermal and Biological) and by Application (Electricity Generation, Heat Generation, and Transport Fuels): Global Industry Perspective, Comprehensive Analysis, and Forecast, 2017 – 2024”. According to the report, global waste to energy market was valued at approximately USD 28.43 billion in 2017 and is expected to generate revenue of around USD 42.74 billion by the end of 2024, growing at a CAGR of around 6.00% between 2018 and 2024. Waste to energy is a process where various technologies are used for the conversion of the non-recyclable waste into the energy. The energy includes various forms such as electricity, heat, and also produces combustible fuels such as ethanol, methanol, and others. The various technologies processing on waste include pyrolysis, incineration, gasification, anaerobic digestion, and landfill gas recovery, among others. Waste to energy management plays a significant role in waste disposal infrastructure of any nation. Rising population which, in turn, has to lead to an increase in the generation of waste is the strong factor prominently increasing the demand for the waste to energy market. Moreover, increasing government initiatives and stringent regulations regarding the waste disposal is also a considerable factor driving the growth of the waste to energy market during the forecast period. In addition to this, rising technological advancement in waste disposal processes is also bolstering the market growth. On the basis of technology, the waste to energy market is bifurcated into thermal and biological technologies. Thermal technologies are further classified into pyrolysis, incineration, and gasification. Biological technology is used in the solid waste where anaerobic decomposition is required. The thermal division dominated the market in 2017 and is projected to maintain its dominance throughout the forecast timeframe. Increasing developments in the technologies of incineration and gasification are the major factor driving the waste to energy market. Incineration thermal technology is anticipated to have the major share during the upcoming years. On the basis of application, the market is categorized into electricity generation, heat generation, and transport fuels. The heat generation is projected to have the strong market growth during the forecast period. As heat generation is achieved by incineration thermal technology. Increase in the incineration thermal technology market will positively impact the heat generation waste to energy market. North America, Latin America, Europe, Asia Pacific, and the Middle East & Africa are the regional segments of the waste to energy market. Europe accounted for a considerable revenue share in 2017 and is estimated to continue its regional dominance over the forecast timeline. The growth in this region is accredited to the technological advancements in waste disposal processes coupled with the stringent regulations and government initiatives to minimize the industrial waste. Moreover, Asia Pacific is anticipated to be the fastest growing market during the forecast period. China and Japan significantly dominated the Asia Pacific waste to energy market in 2017, due to the increasing industrial waste and rising technology adoptions in this region. The major players operating in the waste to energy market are Novo Energy Ltd., Hitachi Zosen, Foster Wheeler A.G., Sierra Energy, Xcel Energy, China Everbright International, Covanta Energy Corp., Green Conversion Systems, Babcock & Wilcox Enterprises, Keppel Seghers, Xcel Energy Inc., Abu Dhabi National Energy Company PJSC, Wheelabrator, Constructions Industrielles de la Mediterranee., Inc., and Plasco Energy, among others.